Reading to kids isn’t just about bonding and avoiding screen time. It’s an important part of keeping kids healthy, specifically when it comes to brain development. With a two-year, $450,000 grant from Kohl’s Cares, Rady Children’s has partnered with several community organizations to launch Health Stars, a literacy program, incorporating both parenting education and health education, aimed at low-income and homeless parents with kids aged 0–8. 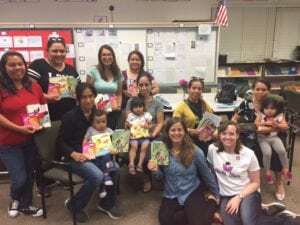 Rady Children’s places volunteer pediatric practitioners in this series of five hour-long sessions aimed at promoting literacy and healthy habits. Practitioners start each session by reading a children’s book, and then continue with advice and training on a specific topic. Parents are given help finding follow-up healthcare for their children, the chance to ask questions, and even insurance options. “Treating disease in our hospitals and clinics is an important part of pediatric care, but we know that it is just as important to promote healthy family behaviors that make communities safer and help children grow to be healthy and successful,” says Wendy Hunter, MD, Medical Director. The five sessions cover oral health, sleep, discipline, nutrition and basic safety, including immunizations. For more information on the Health Stars program or to find participating community organizations, visit rchsd.org/chc. Wendy what an awesome program- I’m not surprised you started this it sounds just like you- hugs! !